We are glad to inform you that our Hidden Gem stock of May'14 - Rane Brake Lining Ltd (BSE Code: 532987, NSE Code: RBL) has achieved its target today giving absolute returns of 105% to our Hidden Gems members in period of 20 months. Our team suggested Buy on Rane Brake Lining Ltd at price of Rs. 200 on 31 May'14 with a target price of Rs. 410. Target is achieved today, stock has made 52 week high of Rs. 427 today on BSE and currently trading at Rs. 400, giving absolute returns of 100% to our members within period of 20 months. ​Company has declared its Dec'15 quarter results yesterday, the company registered sales and operating income of Rs. 111.68 crores for the Dec quarter as against Rs. 101.15 crores for the same quarter of the previous year. 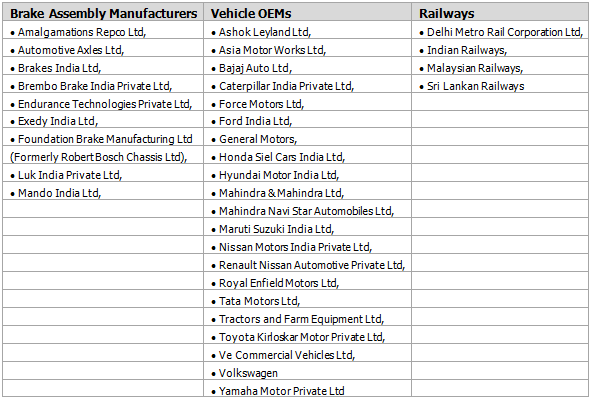 Sales to the domestic OEM, Aftermarket and Railways grew by 7%, 11% and 71% respectively. However there was a marginal drop in the sales​ to exports compared to the same quarter of last year. Rane Brake Lining has posted healthy PBT of Rs. 10.87 crores in Dec'15 quarter against Rs. 5.37 crores in the same of last year registering growth of 102%, EBIDTA is at Rs. 16.44 crores, up by 41% over same quarter last year. We suggest our members to continue to hold the stock as valuations are reasonable and we believe company will continue to perform well in coming quarters like that of previous quarters.